Galleria Auto Glass Service offers affordable and high-quality auto glass repair and auto glass replacement in Houston,Texas. We also offer rear glass, door window, rear-view mirror and other truck and car glass. We are a licensed, insured and locally owned company with more than 30 years of experience. Same-day service is available and all auto glass installations include a lifetime guarantee. Galleria Auto Glass provides you with a wide array of services for windshield replacement and auto glass including door glass, slider glass, quarter glass, and vent glass replacement for all makes and models including foreign and domestic vehicles. We have most all foreign and domestic auto glass in stock. If we don’t have the type of glass you need, we can order and have it the same day. With more than 34 years of installation experience, we have the expertise to provide you with knowledgeable professionals and a lifetime warranty on all of our workmanship. We use the highest quality of adhesives for the quickest drive-away time and can be applied at 0°f and above. We exclusively use Dow Chemical Adhesives that meet OEM (Original Equipment Manufacturer) strength and safety requirements for all vehicles foreign and domestic. The proper use of these adhesives allows for the fastest drive-away time, highest level of safety and reduces the chance of leakage or corrosion. Our auto glass specialists install every windshield using state-of-the-art techniques and materials so you can be confident that your new windshield will measure up to the highest safety standards.We replace windshields in all makes and models of cars. Most windshields are in stock and ready to be installed while you wait. Call us now to get a fast quote for your new windshield, and then drive on in to have it replaced fast. It’s the only thing between you and the open road, whether you drive a compact car, an SUV, a van, a truck or an RV. It allows your passengers to enjoy the scenery, and enables you to keep tabs on traffic. 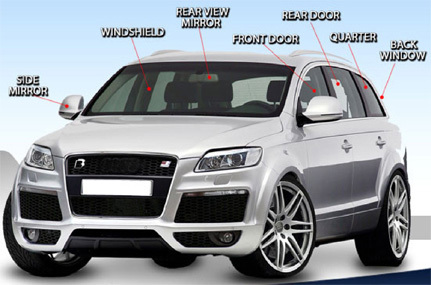 When the side and rear windows are installed according to official safety guidelines by the trained technicians at Galleria Auto Glass, it is one of your car’s most important security features. We’re experts at replacing back and body glass on any make, model or age of vehicle. Best of all, we can usually offer same day service. At Galleria Auto Glass we are the preferred alternative to the dealership for all your Sunroof Glass Replacement and repairs of your loved cars. We are the one trusted auto repair shop for Auto Sunroof for all makes and Models. Since 1981 Our locally owned and operated Galleria Auto Glass has been serving the needs of Houston Texas customers and the surrounding area. Over the years, our facility has experienced steady growth as a result of building relationships with loyal Houston customers and referrals.